The Panda, shown, will not be replaced until 2012. TURIN – Fiat CEO Sergio Marchionne's latest investment freeze will again delay the launch of the third generation of Europe's biggest-selling minicar, the Panda, company sources said. 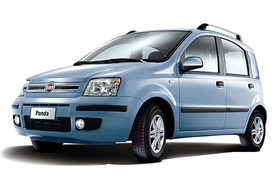 The new Panda has now been postponed until January 2012, people familiar to the matter told Automotive News Europe. Originally due this summer, the Panda's launch had already been postponed until September 2011 in a spending freeze ordered by Marchionne in late 2008 as the financial crisis hit. Other models that will be again delayed include the Lancia Ypsilon subcompact, now due 26 months later than originally planned in May, and two minivans to replace the Fiat Musa and Multipla, which will enter production in the second half of 2012, instead of in December 2011. Marchionne ordered the delays to avoid launching the new models in a declining market. He does not see any near-term recovery in the European market. “Launching new products in a market that is so structurally weak makes no sense," Marchionne said last week at the Paris auto show. "We are saving our ammunition for a recovery." Marchionne sees Western European car sales at about 12.5 million next year, the same as this year but with a very weak first quarter in 2011 compared with the first quarter of this year when sales were inflated by scrapping incentives in key European markets. Fiat's new car sales in Europe are likely to continue to decline without new products. Fiat sales in the EU fell 13.9 percent to 723,356 units in the first 8 months in a total market which slid 3.5 percent to 9 million units, according to ACEA, the European automakers association. Its market share dropped to 8 percent from 9 percent the year before. Erich Hauser, an auto analyst at Credit Suisse in London, said without new products Fiat will not meet its aim of nearly doubling its European market share within four years. “Fiat is trying to almost double sales in the European market from 1.2 million to 2.15 million (in 2014). With an already falling market share in Europe's main countries and a more aggressive competition we fail to see how Fiat can meet its stated objective." Hauser also questioned how long Fiat's European dealer network will tolerate a falling market share and a lack of model launches. Fiat's new freeze in product investments represents a drastic change of route from what the company announced in January when Marchionne said Fiat was planning to return to normal investment levels this year to benefit from an expected European market recovery in 2011. In January, Fiat said it planned to invest about 4.50 billion euros this year, up from 3.38 billion euros last year. Fiat cut investment by almost 32 percent in 2009 from 4.97 billion in 2008. Fiat will unveil how much it has invested this year in January when it reports the full year financial results.